Did you know leprosy still exists? After watching The Fog with my family and being reminded of the disease, I researched it further and found out that it is still estimated to cause the disability of between two to three million people on this planet. Leprosy (or Hansen's disease) is the result of a bacterial infection that, if left untreated, can lead to lesions and deterioration of the skin. The good news is that the World Health Organization (the medical branch of the United Nations) has very effective multi-drug therapies which are currently curing tens of thousands of patients in highly affected countries like India, Brazil and Burma. The disease being taboo, as it happens, poses more of a problem than it being infectious. It is normal for healthcare providers and those in close contact with infected individuals to contract the disease. In fact, varying studies indicate that only 5 to 55 people who come in contact with infected persons contract the disease in every 1000 cases. Like many unsightly things in life, however, most people would rather just avoid the disease and those infected than to seek to understand them and help them. Hopefully by reading this and thinking about it a little more on your own, you too will seek to understand the disease and those infected rather than just be fearful. 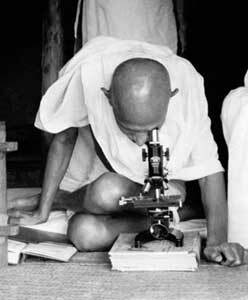 Gandhi said, after looking at the bacteria itself in the picture above, "Leprosy work is not merely medical relief; it is transforming frustration of life into joy of dedication, personal ambition into selfless service."